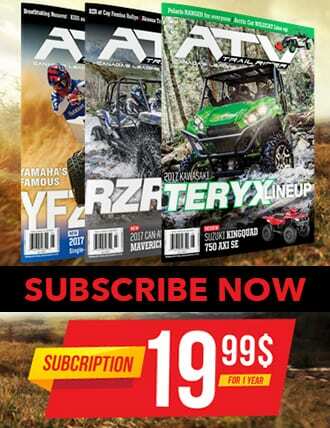 CFMOTO Canada can now boast about being the fastest growing motorsport brand in the country. The ceaseless efforts of their marketing team and their attendance at all motorized events yield positive effects. Their challenge is to provide riding access to more people with the right vehicle in their range. 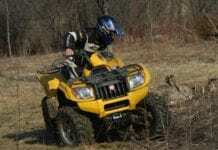 The obvious step is to dispel some reluctance to a little-known brand on the off-road vehicles market. This constant struggle has a very positive impact on sales, and we are witnessing an increased influence of the manufacturer with the emblem that resembles a flag in the wind belted with a graceful silhouette. This tenacity and willingness, however, must be supported by a product that meets expectations. CFMOTO’s reputation is constantly rising and the doubts attributed to a little-known brand until recently are now a thing of the past. The manufacturer has been carefully listening to the comments of its consumer base and this now results in vehicles that directly compare to any other manufacturer. The 5-year limited warranty is one of the highlights of CMI’s (Canada Motor Import) satisfaction and pride in providing dependable vehicles that will appeal to its customers. 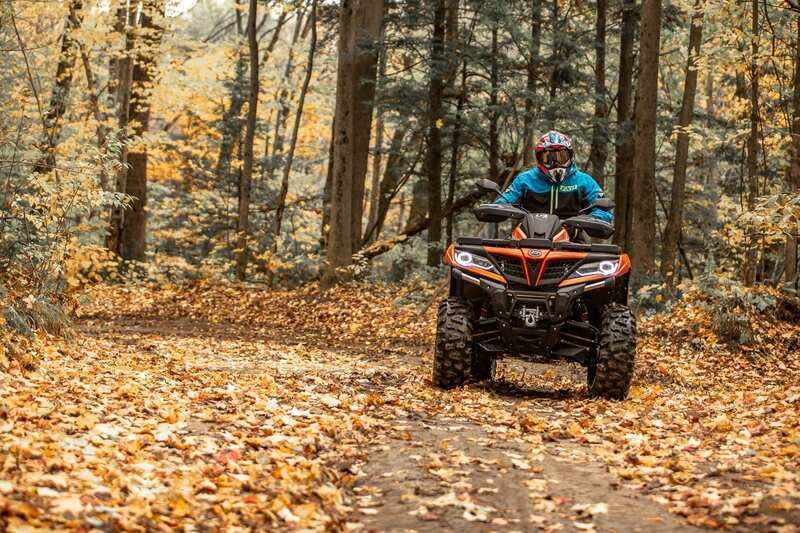 For the year 2019, CFMOTO Canada is proposing a brand-new ATV and the competition that saw this manufacturer coming in their rear mirrors must now look ahead to not lose sight of this important player in the market. 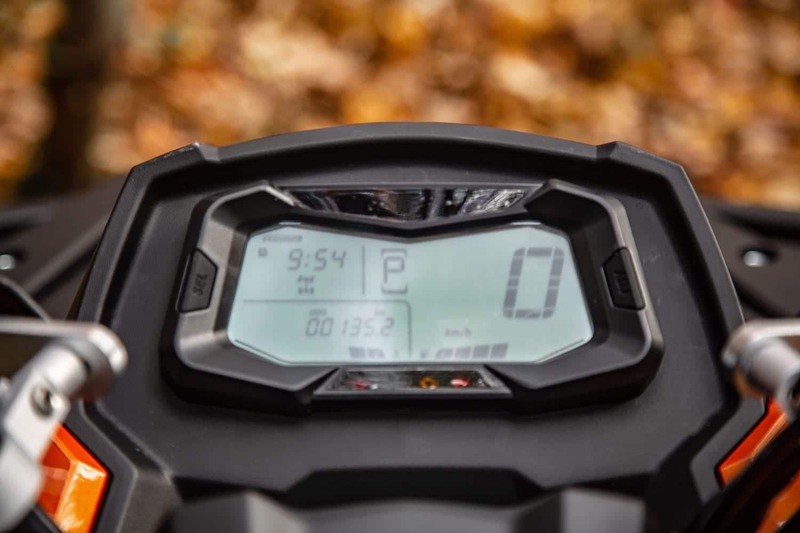 With a view of constant progression, the new model from CFMOTO Canada is a sign of change. In the category that concerns our test vehicle, this is a complete overhaul compared to the previous model. It should be mentioned that, apart from some minor corrections, the basic CFORCE 800 model had not undergone major alterations despite aging that followed year after year. It was a very well-equipped user-friendly vehicle and it offered important elements to please the owners. CFMOTO Canada’s newborn baby has been around the US and European landscape for some time, and we looked forward to its imminent arrival with some form of impatience. However, it is obvious to realize that this new vehicle is not a simple improved copy of the previous model. The CFMOTO 800 XC is a completely different design – the engineers have returned to their drawing table to redesign a brand-new vehicle. Although CFMOTO offers an 800cc engine for some years now and this engine has already proven itself, the one that equips the XC model has undergone a complete overhaul. The all-new CFMOTO 800 XC is available with a new 800cc, overhead cam, V-twin, liquid-cooled engine providing 5 more horsepower compared to the previous version. 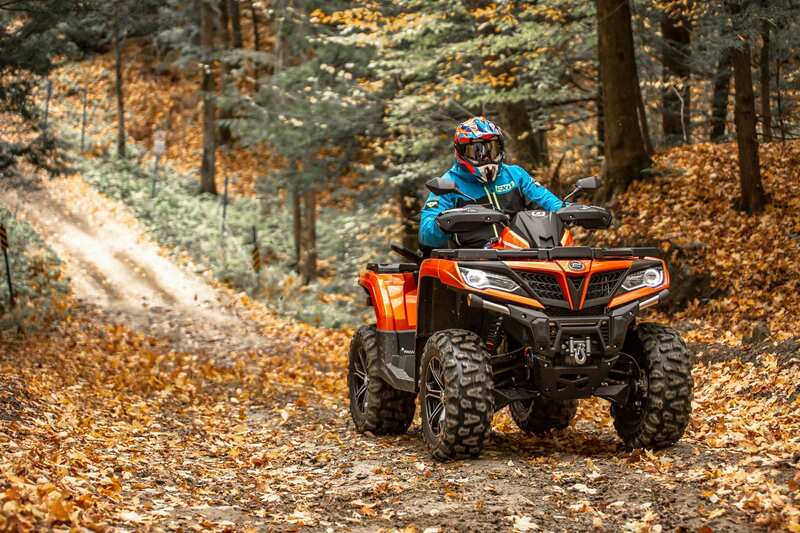 This 67 horsepower at 7000 rpm engine provides plenty of muscle to get through most extreme obstacles and the deepest mud holes. The Bosch fuel injection system supplies fuel to perfection. The additional HP are immediately felt from the thrust of the accelerator. The response is so immediate that we wondered about the numbers from CFMOTO, which we suspected to be conservative. The power delivery is such that we were surprised by the dynamism of this vehicle. This ability, that forced us to firmly grip the 800 XC handlebars, is no stranger to its combination with a CVtech dry clutch. Originally, the 800cc engine in the CFORCE model was associated with a wet clutch. We have already discussed the different characteristics of these two types of clutches (Quadnet.ca / the ATV world, June / July 2018). In summary, while these two types of clutches have their good and bad sides and their own efficiency, the dry clutch offers a more vigorous and a more immediate response than the wet clutch. A dry clutch results is a vehicle that better responds to the rider. However, this winning combination requires a throttle dosage from the pilot on some occasions, otherwise a possible rear axle sideslip will be noticeable. Although the overall appearance of CFMOTO’s previous models is second to none, just like building a new house, a completely new redesigned vehicle had to be built on a solid foundation. In this case, they did not skimp on the means to create a functional chassis that has the capacity to receive the abuse usually reserved for our recreational activity. The looks have been completely revised and it is undoubtedly very successful and attractive. The dimensions are very impressive and make this vehicle a heavyweight in its category. The front grille complemented by the chrome bumper and LED headlights is possibly one of the most successful arrangements on the market. The black and orange durable automotive type bodywork paint is sharp looking. 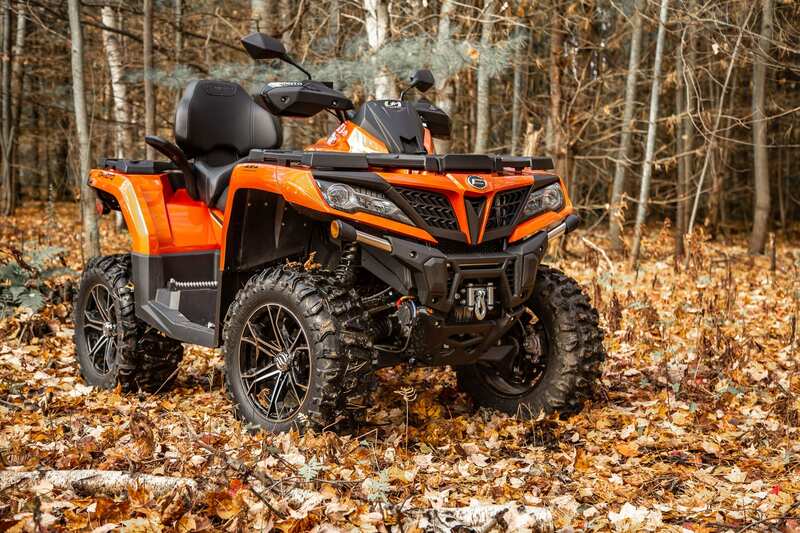 The salient curves and small details make this ATV a very appealing vehicle to look at. USB and 12V moisture-proof accessories plugs have been installed to accommodate those who need to power auxiliary equipment. Also note the brand-new handguards that fit perfectly the overall design of the vehicle. The latter offer adequate protection against the cold weather and other elements that could end up against your passage. The robust and functional design ensures long-term durability. 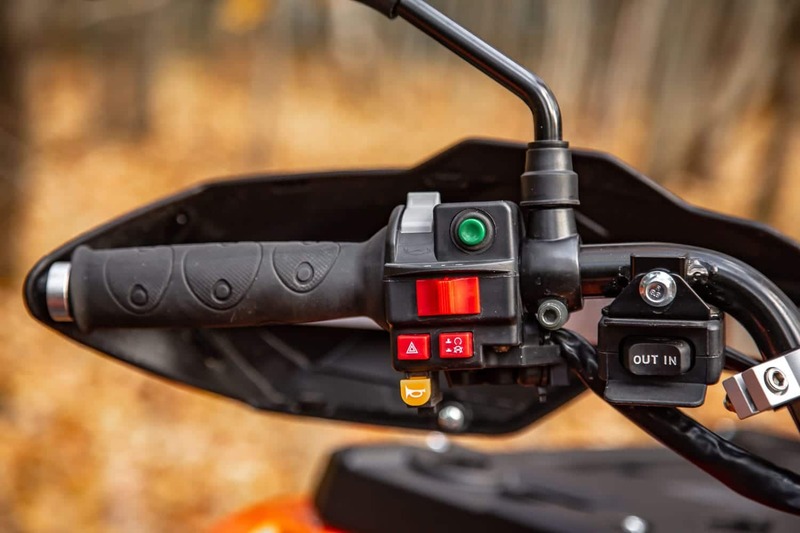 The controls arrangement on the handlebars is very well organized and al controls are easily accessible. The turn signal selection (unique in the industry) is easily done with the left thumb. In fact, all controls are located on the left including the horn switch, hazard warning, start, engine stop, lighting selection and winch control. On the right side, there is of course the throttle control and the traction mode selection (2wd, 4wd, electric differential lock). There is something new that has surprised us by its ingenuity: the parking brake may seem difficult to operate, but when engaged its efficiency is second to none. CFMOTO has thought of all the little details and this one is certainly a nice innovation. When it is engaged, the lever is directly in front of the throttle control. Therefore, it is an obstacle to the actuation of the accelerator and it is impossible to forget it is in use. The LCD display screen provides all necessary functions for proper operation: time, fuel level, speed ratio, trip meter, odometer, voltage, as well as the selection of the traction mode. We would like to warn you regarding the display of the traction mode. It requires a learning curve to understand its meaning. It differs from the previous version, and we were a bit confused during our first use. Another feature that adds to the safety aspect of this vehicle and discourages malicious people: the speed selection knob is lockable to block its movement. This may seem trivial but making life more difficult for an individual who wants to steal our property is appreciated. The designers have taken the bold step of designing a vehicle with eye- catching lines, but also equipped with CFMOTO’s unrivaled success and perfect headlamps and taillights. At this level, they are unquestionably at the highest level and the competition should take this as an example of a high degree of sophistication. Among the standard equipment, CFMOTO has equipped this vehicle with a 3000lb. winch to help getting you out of trouble in case you get stuck with this 970lb. ATV. With regard to the seat, we had already raised questions about its firmness and comfort in the past. In the case of our 2019 800 XC model, this doubt is perpetuated again. Over the kilometers, its hardness has caused us a slight discomfort, and we also wondered about its real abilities to keep a tolerable flexibility in cold weather. However, its height and positioning are perfect for all types of users. The all-new passenger seat offers great back and side support. The handles are well arranged to ensure the passenger safety. This vehicle has only one storage space and it is located at the rear. This area is very limited. Nevertheless, CFMOTO plans to offer accessories equipped with quick couplers that will be incorporated into the thermoplastic luggage racks provided for this purpose. These would greatly increase the storage capacity on this vehicle. These heavy-duty racks provide a combined maximum capacity of 132 lbs. (60 kg). Front access allows fast and easy reach to Relays/Fuses, Radiator and the Yuasa Battery. The famous Yuasa battery is another novelty for CFMOTO for the year 2019. As for the tires, CFMOTO equips most of its vehicles with 14-inch CST ABUZZ 6-ply tires. These tires already have an enviable reputation and are well established for their versatility, regardless of terrain and weather conditions. So, it was a logical choice to equip the 800XC with these tires that are unanimous among their regular users. It’s all well and good, but you probably want to know how the 800 XC behaves on a trail. Well, we loved the overall combination. Its fiery engine, its clutch which responds right away to the thrust of the accelerator and its suspension which is close to perfection oblige us to a certain restraint, because excesses can be easily committed with some absolution made by the quality of the vehicle. The 800XC allows sporty driving at will and the controlled drift of the rear wheels is very enjoyable! It is in an extended test that it is possible to fully enjoy the virtues of a vehicle. In this case, the long-awaited promises turned into euphoria and feast. The light sound, low noise and discreet engine conceals a beast ready to explode at any time. The accelerator must be dosed with a parsimony measure. This control and some form of restraint at times must be taken into consideration to exploit the 67 horses. The rigidity of the chassis combined with an adjustable suspension are working together to allow great control of this beast. Experimented drivers will be able to afford skid-controlled slippage in full glee. These controlled glides give way to corner exits in the desired angle to reach the next curve in the same momentum. This vehicle can also be used in a utilitarian way with its luggage racks with a maximum combined load capacity or with its traction capabilities, but its DNA gives it more recreational qualities. We rode this beast for hours on the trails without feeling tired or bored. This is very eloquent on our overall appreciation. By the way, what is the meaning of the letters ”XC”? We could extrapolate on their designation. It could be translated by eXtreme Control, eXtreme Creativity, or eXtreme Capacity. Our overall appreciation leads us to qualify it as follows: eXtreme Character. 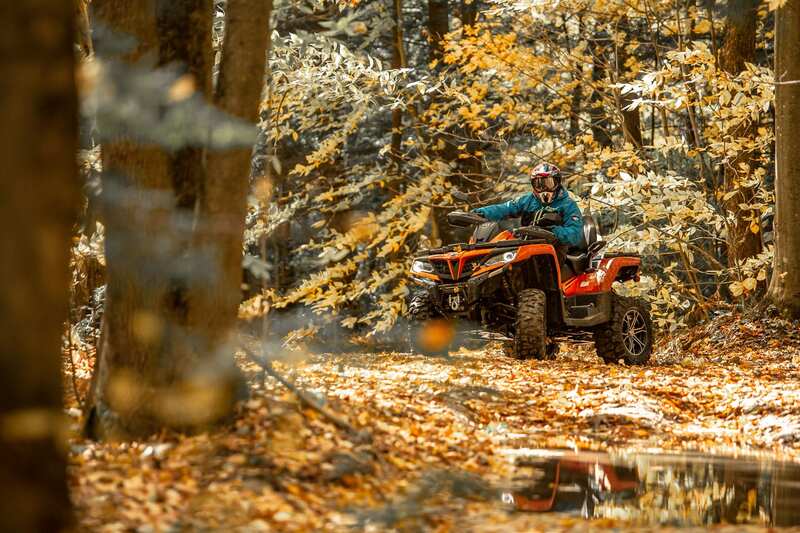 The vehicle overall quality and its way of reacting on the trail are what give it its personality. This is also what gives it a distinctive brand and originality. This virtue will enable it to face the obstacles it has to overcome with confidence and authority. 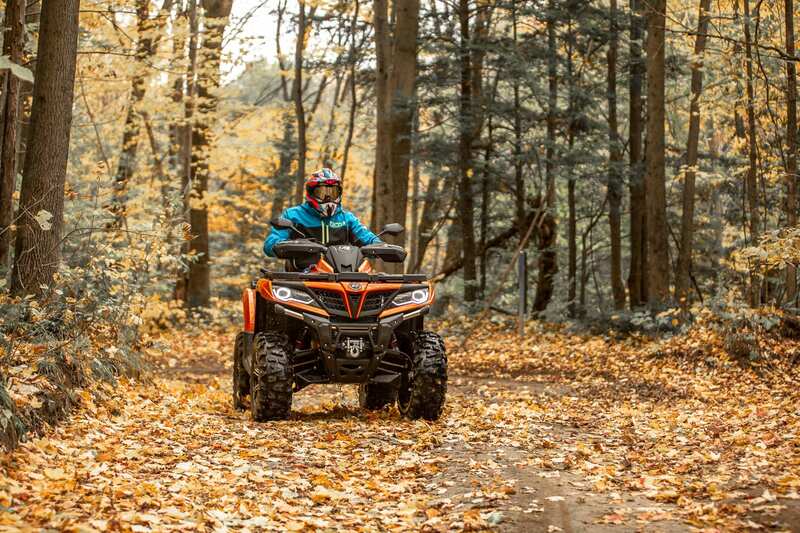 Overall, the CFMOTO CFORCE 800 XC is a purchase to consider for its versatility. It is a vehicle as much capable on recreational or sporty rides, or simply for its utility side and its traction capacity of 873lbs. It can be used alone or with a passenger without its behavior being affected. 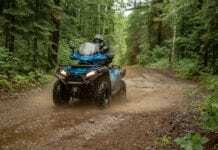 CFMOTO Canada dispels the doubts with its new vehicle and isn’t it the impression they want to maintain? Their answers are innovative vehicles that are amongthe best on the market.